Pinched Nerves. Can Chiropractic Help? Recently, a couple of people have asked me if chiropractic could help with pinched nerves. Well actually, chiropractic is really, really very appropriate for conditions like pinched nerves. Actually, pinched nerve is in the bullseye of the easy stuff of what chiropractic’s about. So let’s recap a little bit. Chiropractic is about correcting the spine to take the pressure off the nerves so that your body can heal from within. The body’s innate ability to heal itself is restored. So let’s think about a pinched nerve. What is a pinched nerve? I got a model here. This is a section of the spine, just a little part of spine. We’ve taken out a couple of vertebrae, and what we see is that we’ve got the bones, and between the bones there is the discs. Now a nice, big, healthy disc is going to look like this one, and it’s going to act as a cushion. It’s going to act as give it mobility, but it’s also creating space for the yellow part that squeezes in between. This is a nerve root, and there is a space right in between each bone here where those nerves come out. 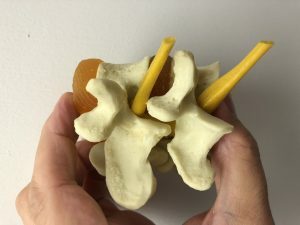 Now, a pinched nerve happens when there is misplacement, a dysfunction or a diminished disc height. Something creates pinching of this nerve as it comes out. These nerves go out of the neck and towards the arm, and can give arm pain, shoulder pain, hand pain, numbness, tingling, that kind of thing. They also go down the leg, sciatica, numbness in the leg, numbness and pins and needles in the foot, pain in the arm, pain in the leg. Those are pinched nerves conditions. Chiropractic is the best solution for that. Now, there is no drugs that is going to unpinch this. There is no drugs that is going to open this spaces up. It’s a mechanical problem. There is no exercise that is going to stretch this out. You actually need to go in and change the way the joint is moving. Chiropractors do that. A chiropractic adjustment does that. And then, imagine the problem now, your brain is utilizing these nerves to make all your body parts function properly and right, and maintain health, maintain vitality, keep you vibrant, and young, and productive. The ramifications are all encompassing! Now, if you have a pinched nerve, you have irritation of those nerve. We often call that subluxations. If that’s going on, not only are you likely to have problems with your arm or with your leg, but your whole, overall ability to function is going to be impaired. And since the brain handles the healing, and through these nerves that very core ability to heal from within is going to be compromised, it’s a big problem. That’s why it’s so important to go to the chiropractor, get adjusted, see us first, get well. Hey, I do this day in and day out, and I love doing it. I can’t wait to help you out.